Unlike the first two days, in which I spent the morning on great B-roads and then had to take the motorway in the afternoon to make it on time, with all the boredom and fatigue that means, today has been the other way round. I got up after a great night’s sleep and had breakfast with Danilo (Mattia had already left for work), trying to have a meaningful conversation in my very poor Italian. 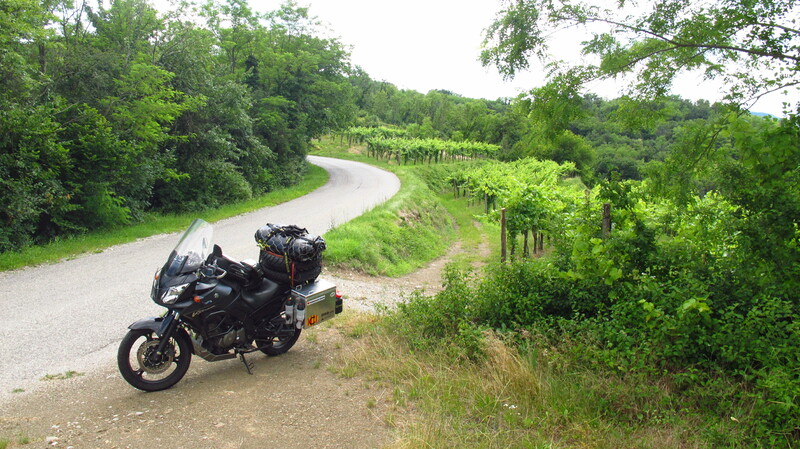 He gave me some directions to get the most scenic route to Slovenia, I loaded the bike and went off. The first part of the route took me through even more industrial parks and thick, slow moving traffic, but I was able to make good progress thanks to Italian drivers. I must now withdraw my previous comments on Italian drivers, as today they were absolutely wonderful – the moment they saw me coming on their mirrors they moved to the right, making way for me to overtake them without having to move over to the other lane, which meant that I could pass cars anywhere. There’s some road manners Spaniards could learn! Shortly after the road became one of the most beautiful I have ever ridden. All the way no just to Slovenia, but to the very capital, Ljubljana, it was a narrow, winding road with smooth tarmac and beautiful views. I had set off with three (out of five) bars left on the fuel gauge and after seeing how expensive petrol was in Italy I was hoping I could make it to the border and fill up in Slovenia. If I had to, I was even going to use the fuel in the jerrycan. I got near the border at about lunchtime and stopped at a village called Gradisca D’Isonzo for lunch. I found a nice park with a memorial to those who had died in WWI and WWII and sat down to prepare a sandwich. As I was eating there, with those names carved in stone in front of me, it occurred to me what a simplistic view we often get of such conflicts. We tend to think of the war as something with clearly defined sides, the good and the evil, the ‘you are with us or you are against us’ kind of thing some Americans love so much. However, those names belonged to young people from a small village who probably knew nothing about the people they were sent to fight against or the reasons the whole thing had started, they were just told to go there and die for their country. A country. What is that? Riding from one to another, crossing borders the concept becomes blurred, artificial. It is just a random line on a map and it becomes clear that we are all exactly the same, with the same hopes and fears, pastimes, worries, and all those little things that make up moments of happiness in our lives. I shared the last cherries from the box I had bought in France with a homeless guy at the park and headed for the border, the fuel light flashing. I stopped at the first petrol station on the other side and was pleased to see that fuel was much cheaper and they had stickers. I filled up and rode into biker’s paradise. Slovenia is a hilly country and it seems that practically all roads are interesting. When I was planning the trip I sat down at the computer and tried to plan the most scenic routes possible on the software that came with the GPS, BaseCamp. I quickly remembered why I prefer to use good old paper maps. As is often the case with case when there are computers involved, the bloody thing had no logic at all and even though I marked waypoints along the route I wanted to follow, it went back and forth, doubling back and sending me round and round to places I did not want to go. In the end I decide to just get the coordinates for the places I want to finish the day at, set it to avoid toll roads and let it guide me. And boy it works! Yesterday’s route could not have been better if I had plotted it myself on a map – the roads were amazing all the way to Ljubljana. I got there a bit later than I expected and ran into the afternoon rush hour traffic. I had to cross the whole city, as my host’s house was on a hill on the outskirts on the other side. I discovered that it is not a good idea to get into heavy traffic in an unknown city tired after a long day’s ride. Fortunately I made it to the other side without problems and were greeted by my hosts, Metka and Franci, fellow bikers who were delighted to see me and the motorbike. 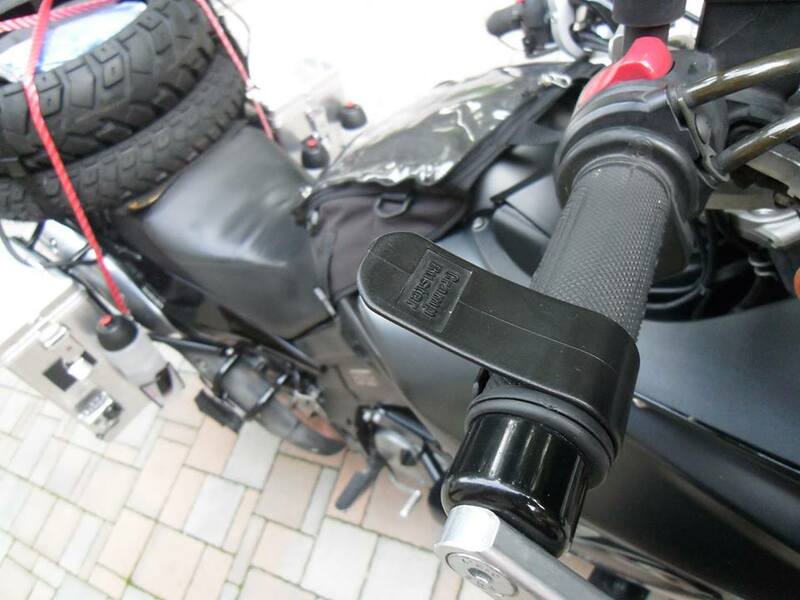 We started talking about it right on the front door, and Franci commented that I should use a CrampBuster, a plastic thingy that allows you to hold the throttle open without having to grip the handle all the time, so you can rest on long motorway trips. I tried to find one in Barcelona just before leaving, but nobody sold them and it was too late to get one online. He then made a quick phone call to a friend to see if it was possible to get one in the city that day and then gave me his own as a present! They took some pictures and showed me my room, which would make a five-star hotel room pale in comparison. Franci works as a translator, but he studied electrical engineering and he really is into domotics. He and Metka bought their house half finished and then he designed a fully intelligent and environmentally friendly house (and wrote the software that controls it himself). It would take pages to describe what the house can do, suffice to say it is mind-blowing. I had a shower, got changed and jumped into the car with Metka, who had already called a friend of hers who spoke some Spanish and was glad to have a chance to practice a bit. On the way to the centre we discovered that we are both beer fans and while we were waiting for her friend Maja to come she took me to a small beer shop that had an amazing selection of beers for connoisseurs. We bought a few for dinner (which she refused to let me pay) and then went for a drink with Maja at one of the terraces by the river. Back at the house, Franci, who had finished work, prepared some traditional pasta and then we had some beers with a couple of their friends, also bikers, who dropped by to say hi. It was such an enjoyable evening, telling travel stories and anecdotes that I totally forgot to write. 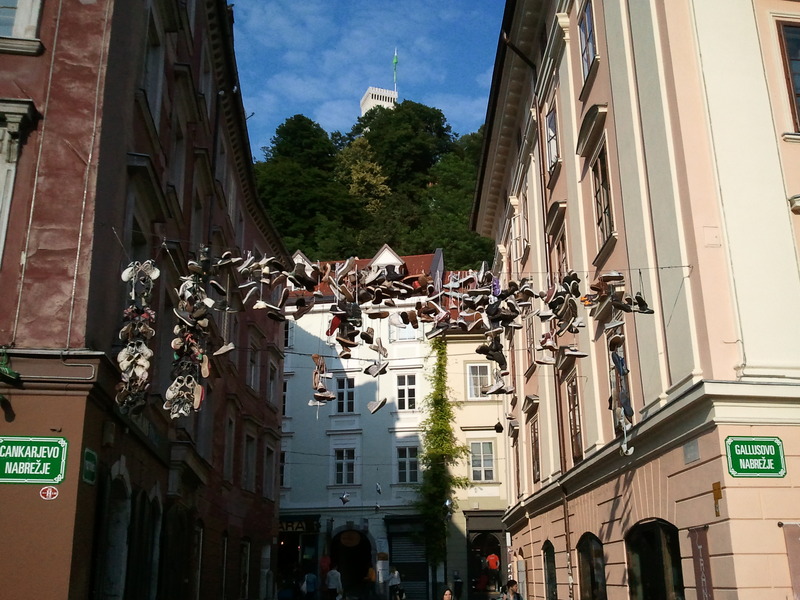 Oh, and Ljubljana is a beautiful city, by the way. This entry was posted in Stroming The World 2013, Travel and tagged couchsurfing, Ljubljana, Mikkeller by Kilian. Bookmark the permalink.